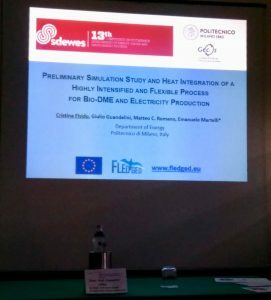 A preliminary analysis of heat integration structure of the FLEDGED process has been presented during the 13th Conference on Sustainable Development of Energy, Water and Environment Systems (SDEWES), held in Palermo on September 30th – October 4th, 2018, with the title “Preliminary Simulation Study and Heat Integration of a Highly Intensified and Flexible Process for Bio-DME and Electricity Production”. 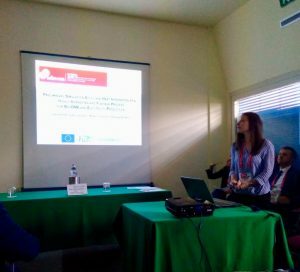 Cristina Elsido (POLIMI) presented the preliminary FLEDGED process model and optimization strategy for heat integration. Download the presentation here. This work, developed by POLIMI, presents the preliminary process modelling study and heat integration optimization for a novel highly intensified and flexible process for the co-production of bio-DME and electricity from biomass. The process combines two “sorption-enhanced” reactors: a flexible sorption enhanced gasification and a novel sorption enhanced DME synthesis. The novel system is being developed in the framework of the H2020 EU project FLEDGED. The preliminary process simulation is based on simplified (first-principle) models of the main process units while the heat integration optimization is performed with a systematic energy targeting methodology. The DME off-gas can be used in a gas turbine or in an internal combustion engine with minor differences in efficiency while the process waste heat can be efficiently recovered by a multiple-pressure-level heat recovery steam cycle. According to the results, the plant can achieve a biomass-to-DME conversion efficiency of 31.14 % (LHV basis) and a biomass-to-electricity conversion efficiency of 19.3 %.